Tablet Shown in Picture is Not Included. *Windows running tablet required. Tablet cannot have RT. TL2200QVP Machine, Frame, Laptop, and tablet are sold separately. QUILT VIRTUOSO PRO NOW AVAILABLE! QuiltMotion will automatically and accurately quilt it! to bring professional, automated quilting to your home. QuiltMotion takes you seamlessly through pattern design to stitching with absolute ease. QuiltMotion comes wit a motor plate and hardware that attach to your sewing machine and quilting frame. QuitMotion lets you place your patterns on quilt the exact way you want, even if you have to stretch or skew a pattern. QuiltMotion's quilt design software comes with a library of over 200 patterns to choose from. Experience the simple yet overall incredibly complete package. Enjoy unique, all-inclusive software - simple, and quilter-friendly. Digitize, size and create your blocks, pantographs, borders and full quilt layouts. QuiltMotion takes you seamlessly through pattern design to stitching with absolute ease. It is so awesome to watch your Juki 2200 QVP stitch out the designs you created. QuiltMotion brings together all the aspects of the quilting process, seamlessly taking you from IDEA to DESIGN to REALITY. Digitize and design unlimited patterns utilizing simplified techniques including tracing, mirrors and optimization. Size and create your blocks, pantographs, and borders to the exact dimensions of your quilt. Precisely place your patterns on your quilt with one of several placement methods. This version of QuiltMotion is made specifically for the Juki 2200QVP. It includes Quilter's Creative Touch. You receive everything you need to mount your Windows 8 Computer Tablet, which you supply, to your Juki 2200. With QuiltMotion/Quilter's Creative Touch, your tablet becomes the touch screen and you control everything from the tablet. 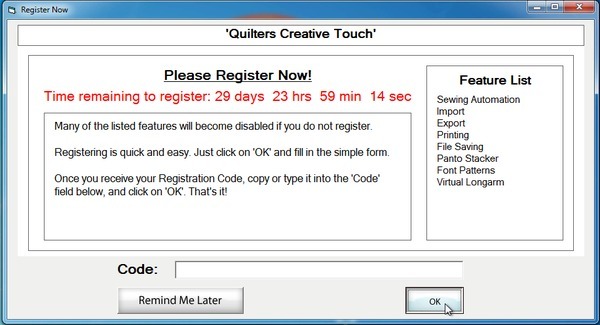 The Quilter's Creative Touch Design Software includes the basic functionality of Quilt Motion with a newly designed user interface and many new user friendly features. Designed for, and works best with Tablets which can be easily attached to your machine (Sold Separately). No computer or laptop needed. Pantograph Creation with "Panto Stacker"
Alternate Rows, Sizing, and Number of Patterns can be edited in a few simple clicks. Add a Unique element to your quilt by including text and fonts from your system. No matter the size of your Sewing Machines throat or arm size, create large designs by splitting your pattern. Works with your existing Sewing Machine and Quilt Frame Combo. This software and hardware combination offer allows you to create free motion quilt designs, and your machine will drive and stitch out the pattern automatically with precision. 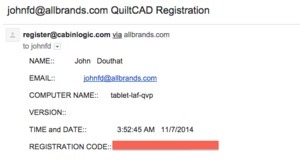 Example: Quilt CAD registration. 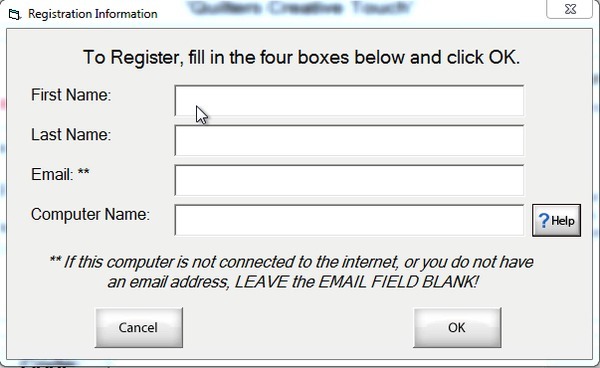 If you need any help, all the instructions for registration are on the first window that pops up when you launch the software. Which tablet is best to purchase for Grace QCT4 Quilt Motion software? Quilter's Creative Touch is best on Windows tablets. The software will also work with any Windows home PC or laptop that meets the system requirements, but it has been designed to be used with touch–screen tablets, offering the freedom to use it wherever you go, and have all of the functionality right at the sewing machine where you need it most. When deciding if your Windows tablet will work with Quilter's Creative Touch, here are some other suggestions to keep in mind. ~QCT4 will only work on devices running Windows 7, 8, 10 or higher. It will not work with any version of Windows RT. ~A 1.66 GHz. or faster processor is recommended. ~A device with a total of 64 GB hard–drive space is recommended, with at least 2GB available for installation. ~2 GB or more of RAM is recommended. ~The included tablet mount will hold tablets with screen sizes from 10 to 12 inches. ~Internet connectivity is necessary for software registration, activation, and card access benefits. ~Screen resolution of 1024 x 768 or higher.